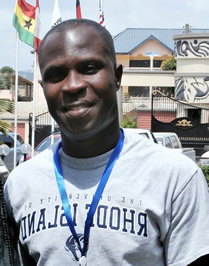 Dr. Emmanuel Acheampong holds a Ph.D in natural science and Master of Science degrees in aquatic ecology and biology. His expertise is in plankton ecology, ecosystem modelling, and aquaculture development. He was a research fellow for five years at the Center for Earth System Research and Sustainability, KlimaCampus, Hamburg, Germany. His responsibilities at this German Center included plankton culturing experiments and research focusing on the development of predictive models for the evolution of aquatic ecosystems. His post-doctoral research was part of two international (European Union-funded) programmes (MEECE – Marine Ecosystem Evolution in a Changing Environment, and EUROBASIN – European Basin-scale Analysis, Synthesis and INtegration) to resolve the impact of climatic processes on marine ecosystems and their services. Currently, Dr. Acheampong is a lecturer at the Department of Fisheries and Aquatic Sciences, University of Cape Coast, Ghana. He teaches both graduate and undergraduate courses including oceanography, management of man-made lakes and biostatistics. 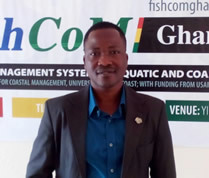 Denis Worlanyo Aheto is an Associate Professor at the Department of Fisheries and Aquatic Sciences and Director of the Centre for Coastal Management (CCM) at the University of Cape Coast. Prof. Aheto has a broad academic training and international exposure. 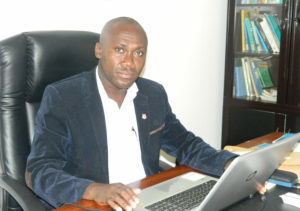 He has participated in scientific researches in his home country, Ghana and elsewhere notably Sweden, Thailand, Namibia, Zambia, and South Africa and presented papers at meetings or conferences in Nigeria, Kenya, Uganda, Tanzania, Japan and Germany and has attended professional training programs in Australia and the United States of America. He holds a PhD Degree in Environmental Sciences from the University of Bremen (Germany) and two Masters Degrees in Rural Development Studies and Tropical Aquatic Ecology obtained from the Swedish Agricultural University (Sweden) and University of Bremen (Germany) respectively. He holds a Bachelor’s Degree in Biological Sciences and a Diploma in Education from the University of Cape Coast. He is Project Manager and UCC’s authorized representative of a five-year fisheries and coastal management capacity development project (2014-2019) worth US$ 5.5 million funded by United States Agency for International Development (USAID) under the Feed the Future Initiative of the American Government. He is lead consultant to the DFID funded project of the Ghana Inshore Trawlers’ Association (GITA), providing technical advice on relevant amendments to the Fisheries ACT 625 and the Ghana Environment Protection Laws relative to oil and gas exploration impacts on marine fisheries. In the past, he coordinated other institutional projects including the World Bank/Danida and Government of Ghana funded aquaculture program financed through the Skills Development Fund (SDF) of the Council for Technical and Vocational Education & Training (COTVET). The SDF Project is an innovative public-private partnership project between Ainoo-Ansah farms and the Department of Fisheries and Aquatic Sciences. Among others, he was co-principal Scientist of AUSAID-funded Fishing for Security Project, which investigated drivers of piracy and other social and environmental factors influencing maritime security; Co-principal Scientist that investigated PAH levels and microbial content of fish from selected markets funded by the USAID/SFMP and the Netherlands Development Organization (SNV). Prof. Aheto is recipient of several academic awards of honour worth over US$ 90,000 including the German Exchange Academic Service (DAAD) for outstanding academic merits, and social engagement at the University of Bremen. His most recent being the Distinguished Lecturer Award at the University of Cape Coast (2015/2016). He served and continues to contribute to the work of some university-wide Boards including his membership on the search committee for the Vice-Chancellor for the University of Cape Coast (2015/2016). He is a member of the UNESCO Man and the Biosphere (MAB) National Committee under the auspices of the Environmental Protection Agency (EPA) of Ghana. He has written several technical reports for donor agencies and has over 30 scientific articles in indexed journals such as Ocean and Coastal Management, Nature, Regional Studies in Marine Sciences, Environmental Sciences Europe, Sustainability, Journal of Coastal Conservation, Plos One, and Wetlands to his credit, with 150 academic citations on Google Scholar. 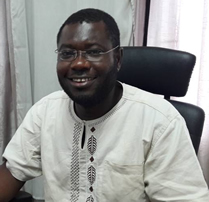 Dr. Noble Kwame Asare is a Senior Lecturer at the University of Cape Coast (UCC), GHANA. He holds a PhD in Marine Biogeochemistry from the University of Plymouth, England, and a Masters degree in Tropical Aquatic Ecology from the University of Bremen, Germany. He is presently the Head of the Department of Fisheries and Aquatic Sciences (DFAS) at UCC, a board member of the Centre for Coastal Management, UCC and the Monitoring and Evaluation Coordinator for the Fisheries and Coastal Management Capacity Building Support Project being implemented by DFAS, UCC and funded by the United States Agency for International Development (USAID) over a 5-year period. He teaches several courses at both the undergraduate and postgraduate levels including physical oceanography, marine ecology, aquatic pollution, brackishwater ecology. His current research work involves pollution and ecology of coastal water bodies, assessment of the biophysical environment with respect to aquatic pollution, ecological and socioeconomic impacts of pollution in marine systems and its significance to the global climate variabilities, microbial ecology of coastal water bodies, and ecological studies of fish fauna in coastal marine environment. Mr. Joshua Adotey holds a Master’s degree in Integrated Coastal Zone Management and a Bachelor’s degree in Fisheries and Aquatic Sciences, all from the University of Cape Coast, Ghana. He is passionate about coastal and ocean processes, and impacts of climate change on natural resources. He currently works with the Department of Fisheries and Aquatic Sciences on the USAID-funded Fisheries and Coastal Management Capacity Building Support Project. His responsibilities, among others, include reviewing project reports, manuals, etc. Mr. Adotey loves to read and write as a form of leisure.